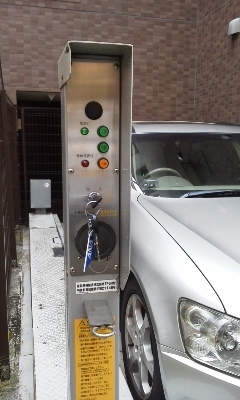 One of Japan’s ever-so-clever solutions to never having enough space for things is the parking elevator. There are two more parking spaces UNDER this car, and this gizmo is the elevator control. I sat on a bench today and watched a man drive his car out of the lowest of the three, then return to the gizmo and lower the top level back down to ground level. It was pretty cool. Then the man got in his car and started to drive away. He left his keys in the gizmo. I thought about running after his car yelling and waving my arms, but then wondered how long it would take someone to call the police and report the lunatic foreign lady terrorizing the neighborhood. Then I realized nobody would steal the keys anyway. What possible use would they be to someone who wasn’t renting one of those parking spaces? The US is the only place I know of where theft is about taking stuff rather than needing stuff. While I was lost in that reverie, I heard someone call, “Eda!” and looked up to see a woman in a lovely white silk kimono. It took me a minute to register Nakamura-san from the dojo. I’m used to seeing her in sweats. When I passed by again an hour later, the keys were still there. The balance between the expected and the unexpected is one of the things that give life its spice.